The intergalactic adventure Aliens Ate My Homework arrives on DVD, Digital, and On Demand March 6th, 2018! This is a sponsored conversation written by me on behalf of Aliens Ate My Homework. Our youngest little was over the moon to receive this intergalactic adventure from Aliens Ate My Homework that included the DVD, film soundtrack, solar system kit, Aliens Ate My Homework book by Bruce Coville and a homework folder with fun activity sheets! Wade absolutely loves the book series so the movie was super fun for him. The move was packed full of adventure, laughs and of course ALIENS! Wade loves also receiving the advanced copy along with this awesome movie kit! 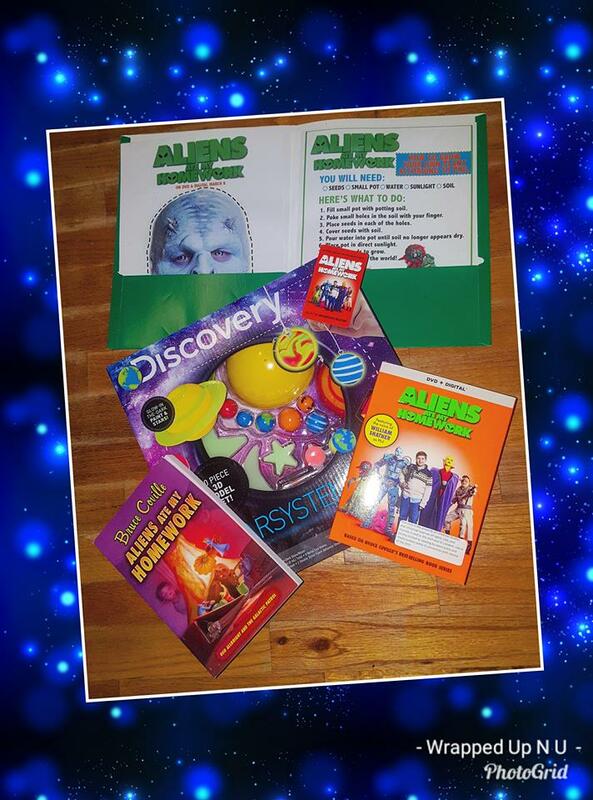 Bring home a fun movie tonight with Aliens Ate My Homework! Universal City, California, January 10, 2018 – Unexpected extraterrestrial guests team up with a pair of middle schoolers to prevent the destruction of the planet in Aliens Ate My Homework, coming to DVD, Digital and On Demand on March 6, 2018, from Universal 1440 Entertainment, a production entity of Universal Pictures Home Entertainment. A humorous and suspenseful intergalactic adventure,Aliens Ate My Homework follows the whimsical members of the Galactic Patrol on the trail of an evil alien criminal hiding out on Earth. The Universal 1440 Entertainment banner develops and produces live-action and animated non-theatrical productions directly for distribution in all media worldwide. Since its formation in 2005, the group has assembled an exceptional roster of animated family fare, including the Daytime Emmy®-winning Curious George television series for PBS Kids and Hulu; as well as the beloved The Land Before Time film series and the all-new animated family film Mariah Carey’s All I Want for Christmas is You. The group also has successfully built upon some of Universal’s highly celebrated live-action, comedy and drama franchises, Scorpion King, Jarhead, American Pie, Honey and Bring It On as well as the terrifying Chucky movies. Projects currently readying for release include the newest installment of the epic sci-fi adventure hitTremors, the next chapter in the gritty action franchise Death Race and an exciting new film from the popular Honey franchise.